Since 1999, Dr. Robert DeCandido has made many research trips to Asia, primarily to study bird migration, particularly raptor migration. In autumn 1999 with Deborah Allen, I first visited the Himalayan Mountains in Nepal to watch the east to west migration of Steppe Eagles and several vulture species traveling from Mongolia and China and heading toward Saudi Arabia and Africa. When a civil war erupted in Nepal in 2000, I was not able to return until 2011 – when my research resumed – and continues to this day. In the meanwhile, in spring 2000-01 we studied the spring migration of birds returning to the Asian mainland (Malaysia) from Sumatra. In 2003, I spent much of the year in Eilat, Israel where I helped band 10,000 or so birds, and watched the raptor migration there. In autumn 2003, I helped discover a bird migration site of global significance in Thailand. For more than a decade, I studied the southbound migration of 25+ raptor species (and 500,000+ migrants), along with bee-eaters, Pacific Swifts and others. In winter/spring 2005, I spent several months in the largest preserve in Sabah, Borneo studying the birds, insects and plants of that Malaysian state. Publications about Asian birds from our research along with colleagues in Asia have appeared in The Journal of Raptor Research, The Wilson Journal of Ornithology, Forktail, Ardea, BirdingAsia, and The Journal of the Yamashina Institute of Ornithology. However, though all of this foreign research may seem impressive, Deborah Allen and I are most proud of our work in NYC. 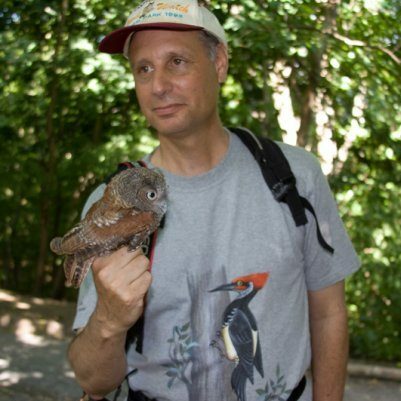 Since 1992 we have been leading bird walks in Central Park (see www.BirdingBob.com ), and conducted many research endeavors as well. We have studied the night migration of birds from atop the Empire State Building – including the first study of night hunting Peregrine Falcons; we have studied American Kestrels nesting on buildings in Manhattan and the other boroughs of NYC; and we have written about the eight owl species that winter and breed in New York City parks, and the long-term changes in the flora of the Big Apple. Popular and scientific articles about our Asia and New York City research are free and available upon request. DEBORAH ALLEN Accomplished photographer and natural history writer, Deborah Allen has photographed more than 600 species of birds, including more than 350 species in North America. She has also traveled extensively, photographing birds in Costa Rica, Malaysia, Thailand, Israel, and Nepal. LYNN BJORKMAN Lynn Bjorkman has a BA and MA in English from the BYU, teaching English for 37 years. He was the adult leader of 11 year old scouts in three different cities. He loved this for it took him out into the mountains to hike and instill the love of nature into his scouts. You will find Lynn out biking the trails whenever he has free time. Lynn and his wife served a two-year LDS Mission in Taiwan learning some of the Mandarin language and a whole lot about the people there. Lynn and wife Donna moved to St. George in 2004. He keeps busy volunteering at Zion National Park and with NAMI, and REACH4HOPE and currently busy with the St. George Family Search Library as well as the Winter Bird Festival. LYNN CHAMBERLAIN Lynn Chamberlain has spent the last 40 years photographing the wildlife and wild places of the United States. His interest in nature photography led him to earn a bachelor of science degree in biology and a bachelor of arts degree in photography. Over the years he has covered much of North America from Maine to California and Alaska to Hawaii capturing the beauty of the land and the majesty of its wildlife. He has been published in many national magazines, several books and numerous other publications. Lynn has a lot of experience promoting outdoor photography on television. He was the producer and host of the “Photo Tips” segment of a television show entitled “Utah Wild” which aired on PBS for 8 years. In 2006 and 2007 he produced and hosted a weekly show for The Outdoor Channel called “Outdoor Photo Adventures.” Lynn is an active advocate of wildlife viewing in Utah. He has started several successful viewing events and festivals including the Tushar Mountain Goat Watch the Delta Snowgoose Festival and as an active part of the birding community in Southern Utah for many years he is a cofounder of the St. George Winter Bird Festival. He is now engaged in the production of photography education videos that are available on the internet. Lynn has developed a philosophy over time that is fundamental to the work that he produces. Simply stated, it is “the more you know about nature and wildlife, the better you will be able to capture it through the lens of a camera and the more enjoyment you will have along the way.” Lynn considers himself an educator with a camera and loves to talk about wildlife and nature almost as much as he loves creating beautiful photographs. He teaches advanced courses in digital photography at Dixie State University. His workshops and seminars are always well attended and well received. Viewers find his videos very informative and well presented. Lynn is a native of Southwestern Utah and currently lives in Toquerville. He and his wife Kay are the parents of 5 children and the grandparents of 19. MARILYN DAVIS Marilyn Davis started birding whilst working at Zion National Park. She has organized and actively participates in the Red Cliffs Audubon since 1996. Marilyn writes weekly articles, “Artist and Birds,” for her local paper. She routinely engages in schools and outdoor nature presentations for youth and their parents, while staying active in the Desert Wildlife Festival and implemented the Winter Bird Festival with city employee, Josh Oldham, in 2003. KEITH DAVIS Keith Davis began his birding experience through participating in the Christmas Bird Counts with his wife in 2001. He consistently gathers information about bird life and participates in school activities, outdoor nature programs, and indoor historical presentations for students and adults. Keith enjoys feeding a plethora of bird species in his one-acre yard. MAURICE DEMILLE Maurice DeMille grew up in Southern Nevada. He moved with his family to Southern Utah in 1999. He received a B.S. degree in Zoology and went to Dental School in Portland, OR. He has recently retired from private dental practice and is an adjunct faculty member at Dixie State University in the Dental Hygiene Program (working about ½ time). He also enjoys his 2nd career as a birding guide (Zion Birding Tours) and he loves spending time with his family, friends, and in church and community service. KERMIT EARLE Kermit Earle loves the many opportunities southern Utah offers to everyone who comes here. He has become friends with mountain, desert, and birder bikers — enjoying each new found place. Kermit (the Frog) Earle would like to share his experiences with others. CHRISTIAN EDWARDS A Utah native, Christian Edwards received his BS in Zoology from Weber State University and his MS in Biological Sciences from Fort Hays State University. He has worked as a Virgin River Native Aquatic Biologist for the Utah Division of Wildlife Resources since 2009. His work includes native fish monitoring, riparian habitat restoration, and monitoring of an endangered bird species, the Southwestern Willow Flycatcher. Christian is also an adjunct instructor of Biology and Ornithology at Dixie State University, where he has been teaching for seven years. RICK FRIDELL Wildlife Biologist for the Utah Division of Wildlife Resources. BS in Wildlife Biology from Kansas State University and MS in Wildlife Ecology from the University of New Hampshire. Moved to southern Utah in 1991 to work on wildlife conservation and research projects; currently manages the UDWR Washington County Field Office in Hurricane. An avid interest in birds evolved into birding and writing for several national journals, including serving as the Great Basin Regional Editor for North American Birds since 2003. Other hobbies include photography, hiking, baseball, and exploring rock art. KEN HINTON Ken was born and raised in Hurricane, Utah. He graduated from BYU with a bachelor’s and master’s degree in accounting. He worked as a certified public accountant for 35 years in a firm that he became an owner in, HintonBurdick, CPAs and Advisors. He retired in 2014. He and his wife, Kay, have been blessed with three wonderful daughters and 13 grandchildren, all of whom are the major focus of their lives. From 2015 to 2017, Ken and Kay served as missionaries in rural, northeast Japan. While there he had the chance to learn about the birds that inhabit that part of Japan. Ken has always had an interest in and love for God’s creations. He has watched and studied birds since his earliest memories. He enjoys sharing this hobby with his brother, Don. They have assisted in the local annual Audubon Christmas Bird Counts for decades and have helped with the Winter Bird Festival for most of the past 10 years. CASEY JONES Casey Jones is a horticulturist who works as a curator at the Demonstration Gardens. He conducts landscape and gardening workshops for the public, and is an excellent birder, offering tips to entice birds to inhabit your yard. JOHN KELLAM John is the wildlife biologist for the BLM/St. George Field Office, administering Red Cliffs and Beaver Dam Wash National Conservation Areas, and has a broad background in wildlife research/management working with threatened and endangered species in North America and the Tropical Pacific. SHAWN LANGSTON Shawn Langston is a wildlife biologist for the BLM/Arizona Strip District. He has also worked for the US Forest Service in Wyoming, Montana, Alaska, and North Carolina. He frequently submits checklists to eBird. LUCY ORMOND Deep in my soul, there has always been a love for birds for as long as I can recall. At age ten, I was a Junior Audubon member. We built birdhouses. I thought birds migrated from northern Utah to southern Utah and back every year. A pair of binoculars was a retirement gift and I began looking at birds. My “ah-ha” moment was with the reading of “Living on the Wind – Across the Hemisphere with Migratory Birds,” by Scott Weindensaul. I was hooked! Now birding is my passion – no, my obsession! I’ve traded bicycling around the world for birding around the world. My greatest joy is leading the weekly “What’s Flyin’ in Zion” birding walks for Zion National Park. CORDELL PETERSON Cordell’s first career was as an aviation storekeeper in the Navy, and he retired as a Chief Warrant Officer. After moving to St. George, he attained a Bachelor’s of Science in Biology from Southern Utah University. Post-graduation, Cordell worked in the field for a private contractor, conducting Desert Tortoise and Bearclaw Poppy surveys in preparation for the initial Washington County Habitat Conservation Plan, as well as surveying Mexican Spotted Owls on the Dixie National Forest. Cordell was subsequently hired by Utah Division of Wildlife Resources (thanks to Rick Fridell) as a technician for the non-game section. Work for the Division consisted of surveying Ferruginous Hawk nesting sites, winter raptors; in addition to prairie dog surveys and trap/relocation projects, bird banding, and bat mist-netting projects throughout Southern Utah, including initial bat surveys for the Grand Staircase National Monument. After leaving the Division, Cordell continued winter raptor surveys on his own, with his partner, Sandy; still providing their data to the Division. Later, thanks to Hawkwatch International, he established an Enterprise Winter Raptor Survey Route for monitoring wintering raptor population fluctuations. Recently, Cordell has participated in the Hawkwatch Short-Eared Owl Project with the assistance of Red Cliffs Audubon and the Division of Wildlife Resources. DR. JOSEPH PLATT Dr. Joseph Platt is an ecologist based in St. George, UT. He has spent more than thirty years in environmental work in Arctic Canada, Arabia, East Africa and throughout the US. Beginning with his Master’s and Doctorate research, he has focused on birds of prey. He has extensively studied nesting behavior of protected species and been an active bander of species including bald and golden eagles, peregrine falcon, gyrfalcon, osprey, merlin, and numerous shorebird and passerine species. Along with over a dozen published peer reviewed scientific articles and three book chapters, he has presented scientific papers in 13 countries. He is a past member of the Board of Directors of the Peregrine Fund and the World Center for Birds of Prey. He also served on the editing board of the Journal for the Raptor Research Foundation and a member of the California Burrowing Owl Consortium. Joe is a graduate of Utah State University, Brigham Young University, and his Ph.D. from Cornell University. JUDY SCHATTNER Judy Schattner has a background of birding in the Blue Ridge Mountains of North Carolina and has led bird walks for the New River State Park. Judy and husband Joe moved to St. George in May 2016 to be closer to family. She loves identifying, discussing, and watching birds any time, even in her backyard. Judy enjoys meeting new birders. MIKE SCHIJF Mike currently works for Washington County as the Biologist for the Red Cliffs Desert Reserve. His interest in birds and other wildlife started at a young age; probably because his dad was a Game Warden who brought home confiscated wildlife from time to time. However, his passion for birding has grown significantly just in the past year. He especially enjoys searching for rare and vagrant species. He loves birding because each time you set out, you never know what you will find. SETH TOPHAM Seth Topham is an environmental consultant with Stantech Environmental Consulting Company. He has degrees in Biology and Global Information Systems Operations from Southern Utah University. He has been a resident of St. George, Utah, with a keen interest in wildlife since first grade. His research on Desert Tortoises earned him a first place finish in the Zoology component at the International Science and Engineering Fair. He was selected to share his research in London England, at the Youth Science Fortnight. Seth has an acquired expertise in the identification of native plants and animals, and is sought after as a field biologist and naturalist. He is also an accomplished photographer. With an interest in birds since his youth, he has amassed an extensive image library of local birds in their natural habitat. MARSHALL TOPHAM Marshall Topham was born and raised in Southern Utah. He obtained his bachelor’s degree from Southern Utah University, where he majored in Zoology with minors in Botany and Chemistry. He earned a master’s degree in Entomology from Utah State University. His love for the desert and teaching brought him back to Nevada, then Arizona, and now Utah. An educator by profession, he taught Biology and served in public school administration for 40 years; retiring in 2013. Marshall has been very involved with community, serving on numerous boards and committees for federal, state, and local entities. He currently serves on the Technical Advisory Committee for the Red Cliffs Desert Reserve. A life-long bird enthusiast and educator, he continues to teach (Environmental Science) at Dixie State University. GORDON WARREN Gordon Warren has always been a guy on the go. He was a teacher of speech, drama, debate, and English for 32 years, then retired and taught more around the world, including Japan, Malaysia, and the United Arab Emirates, with lots of side trips to interesting countries in those areas. He enjoyed getting to know the people and the cultures of the different beautiful places in this big world. Gordon and his wife, Judy, retired here to St. George in 2002 to enjoy the red rock country. You can find Gordon out biking on paved trails or mountain bikes tracks all over the area, hiking, bird watching, camping, or playing his Native American flutes in canyons. KEVIN WHEELER Kevin Wheeler is a birder (= fanatic bird watcher). He birds when he drives; he birds when he hikes; and he birds when he sleeps. His wife and children are also birders, usually when they want to spend time with him. Kevin has birded lots of places, and seen quite a few birds, but still gets excited about herons, kingfishers, quetzals, and the like. PAM WHEELER Pam Wheeler has been interested in wildlife from an early age, and received a bachelor’s degree in wildlife biology. She worked for Utah’s Division of Wildlife Resources, working with various non-game species including ferruginous hawks, pygmy rabbits, and southwestern willow flycatchers. She is currently busy raising the next generation of Wheeler biologists. HAWKWATCH INTERNATIONAL Hawkwatch International (HWI) is a non-profit conservation, research organization that monitors and protects birds of prey through education, long-term monitoring, and on-the-ground scientific research, utilizing raptors as indicators of ecosystem health. RED CLIFFS AUDUBON The Red Cliffs Audubon was introduced to southern Utah in 1996 and has been active ever since with monthly general meetings and field trips, a weekly newspaper column about bird life, and spend many days teaching both students and adults about the pleasures of our local birds. They are active supporters of the St. George Winter Bird Festival, as they serve on committees and conduct presentations and advertisement for this festival. Visit their website at redcliffsaudubon.org.